Pfc. Ernest L. Hoover, son of Mr. and Mrs. Ernest L. Hoover, graduated from Manitou High School. He entered the Army Air Corps June 1945. His basic training was at Sheppard AFB, Texas. 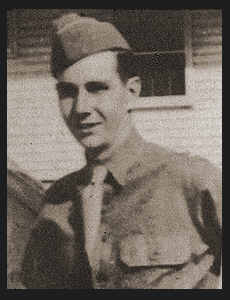 Originally trained as a gunner, he was sent to Indiantown Gap, PA, after the A-bomb changed many plans. to help discharge soldiers. He helped figure railroad mileage for the soldiers going home at $0.05 a mile and $0.08 a mile for officers. He helped close a military hospital, guarded German POW's at Ft. Mead, Maryland, and drove a bus for the Motor Pool until he was discharged November 1946.